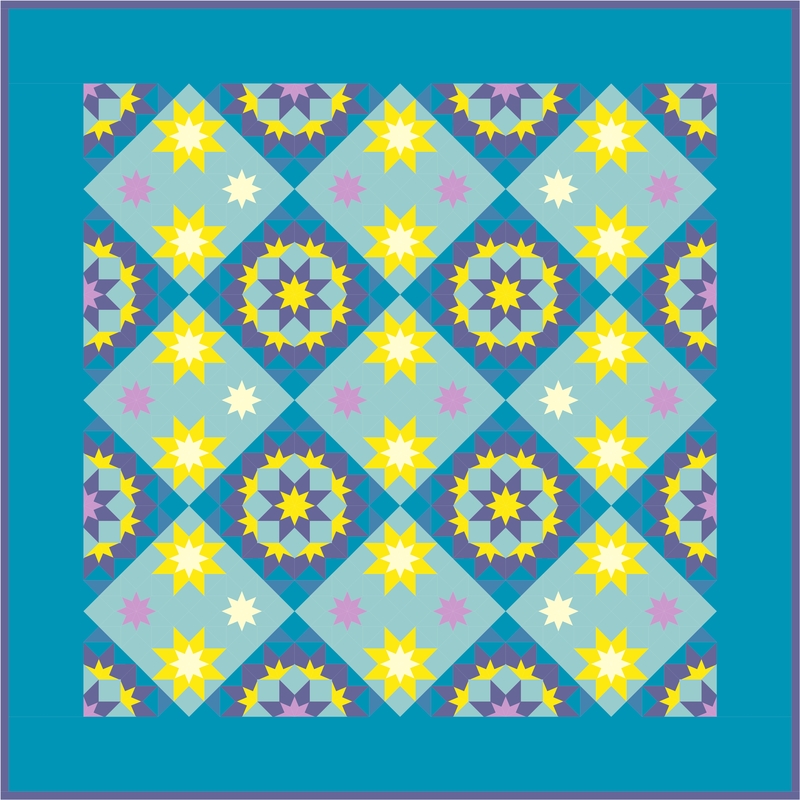 Medallion quilt with 18 inch Morse Star block in the centre, surrounded by a border of 9 inch Inklingo Stars. 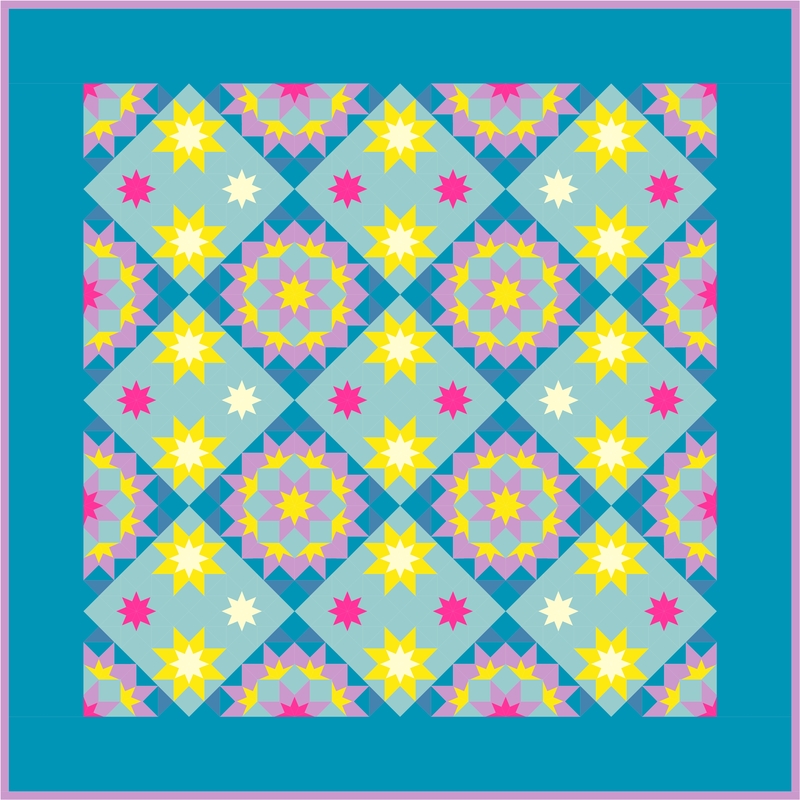 Original quilt design by Annika Kornelis – Medaillon quilt met 18 inch Morse Star in het midden, en daarom heen een rand van 9 inch Inklingo Stars. Origineel quiltontwerp van Annika Kornelis. In mijn vorige post (alleen in het Engels) heb ik laten zien hoe ik het Inklingo Star blok heb getekend in EQ7. Vandaag gebruik ik Inklingo Star als basis voor het tekenen van het complexere Morse Star blok in EQ. Het blok is complexer, maar het tekenen zelf is eenvoudiger. Het is eigenlijk vooral kopiëren en plakken. Als je het EQ projectbestand met Inklingo Star van Linda Franz (gratis!) hebt gedownload, kun je het Morse Star blok eenvoudig zelf creëren, zonder echt te tekenen. Importeer een afbeelding van het blok in EQ, en zet het op je ‘drawing board’ om over te trekken. Het kan je helpen het juiste raster en de bijbehorende snap settings te vinden. Zoek in de EQ Block Libraries een blok dat lijkt op het blok dat je wilt tekenen. Vaak vind je er wel een. Importeer dat in je Schetsboek om te bewerken. Met een beetje geluk hoef je alleen de kleurverdeling van licht en donker aan te passen, of wat lijnen weg te halen of toe te voegen. Trucje 2 heb ik hier gebruikt. Door in de EQ Block Libraries te zoeken in de categorie Classic Pieced: Eight-Pointed Stars, vond ik twee blokken die genoeg op Morse Star lijken om bruikbaar te zijn (Dutch Rose en Carpenter’s Wheel). De video begint met deze twee blokken in mijn schetsboek, plus het Inklingo Star blok dat ik in de vorige video heb getekend. Wat er kan gebeuren als je lijnen verwijdert uit een blok. 18 inch Morse Star blokken op de punt, met 9 inch Inklingo Stars en 4,5 inch Lemoyne Star blokken. Origineel quiltontwerp van Annika Korneils. Nadat ik de overbodige lijnen uit het Carpenter’s Wheel blok heb verwijderd (inclusief een lijn onderin het blok die ik wel nodig heb, ipv een overbodige… Sorry! ), kijk ik ter controle naar het blok op de Color tabblad, voordat ik tussentijds opsla. Daar zie ik dat de verwijderde lijnen nog steeds in het blok staan. Op de een of andere manier heeft EQ de verwijderde lijnen niet ‘gepakt’, dat gebeurt vaker. Als je het blok nu zou opslaan, krijg je de melding dat het blok al in het Schetsboek staat. Als dat gebeurt, weet je dat je nog iets extra moet doen om de verwijderde lijnen echt weg te halen. En dat is, een willekeurige lijn toevoegen! 18 inch Morse Star blokken op de punt etc. Zelfde quiltontwerp als hierboven, kleurvariatie. Origineel quiltontwerp van Annika Kornelis. Dus, ik ga van het Color tabblad weer naar het EasyDraw tabblad. Vervolgens haal ik een lijn weg die ik eenvoudig weer opnieuw kan tekenen. Ik voeg dat lijntje weer toe. Nu kan ik het blok veilig tussentijds opslaan, zonder dat ik overnieuw moet beginnen met het verwijderen van de lijnen. Als ik daarna op het Color tabblad kijk, zie ik een ongekleurd blok, waaruit alle verwijderde lijnen ook echt verdwenen zijn. Morse Star blokken op de punt, met 4.5 inch LeMoyne sterren. Origineel quiltontwerp van Annika Kornelis. Dat je lijnen uit het ene blok kunt kopiëren en dan in een ander blok kunt plakken. Dat je lijnen tijdelijk naast je blok kunt parkeren. Het gebruik van de Pick Tool, en dan de Symmetry optie. Ik kan zelf maar niet onthouden wat elke ‘Flip’ optie precies doet. Daarom laat ik het effect van alle ‘Rotate’ en ‘Flip’ opties achter elkaar zien. De video duurt bijna 12 minuten, maar na ca. 5 minuten heb je alle stappen wel gezien. Daarna is het alleen nog een herhaling van het plaatsen van de diverse sets geroteerde lijnen. De video heeft geen geluid. Ik hoop dat je de video met bovenstaande uitleg duidelijk vindt, en dat je, net als ik, geïnspireerd bent om met Morse Star blokken te gaan spelen! In my previous post I showed you how I drafted the Inklingo Star block in EQ7. Today I am using the Inklingo Star block I created in the previous video, as the start for drawing the more complex Morse Star block in EQ7. While the block is more complex, the drawing is actually much easier. It is mainly copy and paste! If you have downloaded Linda Franz’s (free!) EQ project file with Inklingo Star, you can easily create the Morse Star block in EQ, without any actual drawing. 18 inch Morse Star blocks in a horizontal set, with 4.5 inch LeMoyne Stars. Original quilt design by Annika Kornelis. Import a picture of the block into EQ, and put it on your drawing board for tracing. It can help you find the right grid and snap settings. Search the EQ Block Libraries for a block that is similar to the block you want. Often you will find one. Add that to your Sketchbook, to edit. With a bit of luck you only need to change the light-dark color distribution, or to delete or add some lines. I used this second tip for Morse Star. Through a search in the Classic Pieced: Eight-Pointed Stars block section of the Block Libraries, I found two blocks that look enough like Morse Star to be usable (Dutch Rose and Carpenter’s Wheel). The video starts with these two blocks in my Sketchbook, plus the Inklingo Star block that I drafted in the previous video. A thing that can happen when you remove lines from a block. 18 inch Morse Star blocks on point, with 9 inch Inklingo Stars and 4.5 inch LeMoyne Stars. Original quilt design by Annika Kornelis. After I deleted the lines I don’t need in the Carpenter’s Wheel block (including one line that I actually did need, instead of the one I intended to delete… Sorry! ), I check what my block looks like on the Color Tab, before I save. There I see that my deleted lines are still visible in the block. For some reason, EQ did not take my changes. It sometimes happens with deleting lines. If I would save my block at this stage, EQ would say that this block is already in my Sketchbook. When that happens, you know you have to do something extra to actually remove your deleted lines. And that is, to (randomly) add a line! 18 inch Morse Star blocks etc. 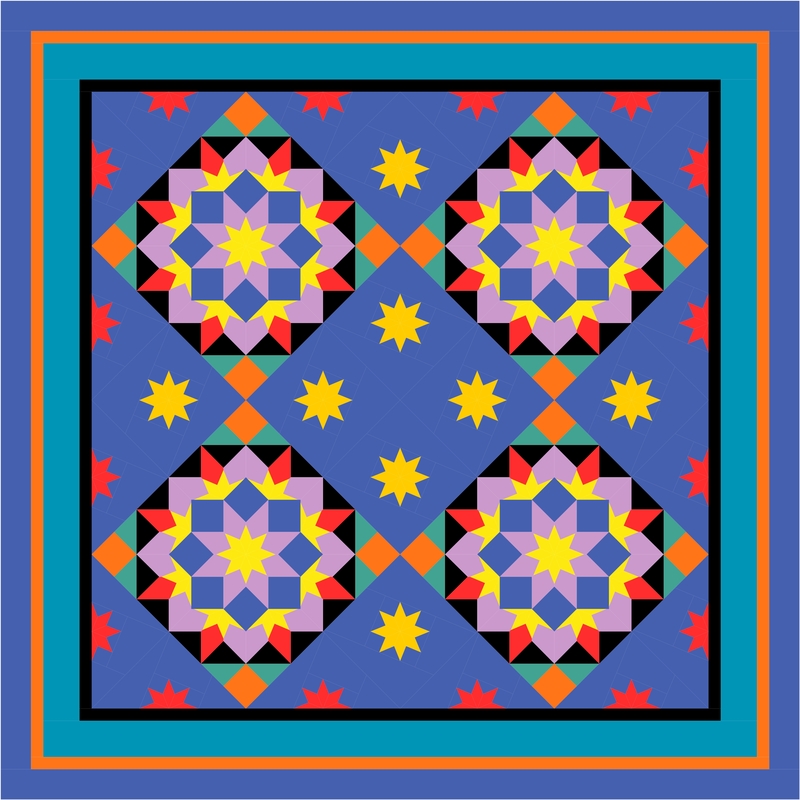 Same quilt design as above, color variation. Original quilt design by Annika Kornelis. So, I return to the EasyDraw tab. There I delete a line that I can easily draw in again. Next, I draw that line. Now I can safely save my block, without the risk of having to start over with deleting my unwanted lines. When I check my Color tab after that, I see an uncolored block, from which all of the deleted lines have actually disappeared. Morse Star blocks on point, with 4.5 inch LeMoyne Stars. Original quilt design by Annika Kornelis. That you can copy lines from one block, and paste them into another block. That you can temporarily park lines outside your block edges. The use of the Symmetry option of the Pick Tool. I seem to be unable to memorize what each Flip option actually does, so I am showing the effect of each Rotate and Flip option in a row. The video is almost 12 minutes, but after five minutes you have seen most of the steps. After that it is just repetition of placing the sets of rotated lines. I hope you will find the video clear with my explanation above, and that you will be inspired to play with Morse Star blocks, just like I was! 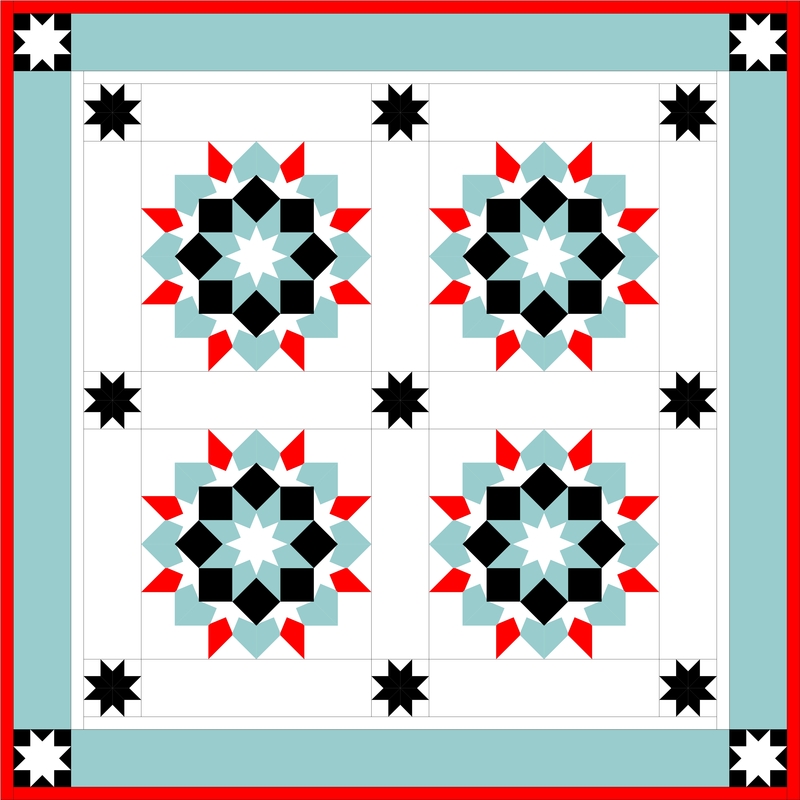 A very pretty Inklingo block is a design by Linda Franz, which she named Morse Star. It is based on another beautiful star block design of hers, Inklingo Star. It is a 9 inch block, which uses the free Inklingo shape collection for the 4.5 inch LeMoyne Star in the center. Both date from 2014. Ever since, I have been meaning to show you how I drafted Morse Star in EQ7. There already is a great tutorial by Erin, but I did it a bit differently. Since there are usually several ways to do something in EQ, I thought I would show you my way, too. Erin’s starts using Linda’s EQ7 file as a basis. You can do that, too, and skip my tutorial altogether :-). Purely for educational purposes, I am starting with drafting Inklingo Star from scratch. It shows both ways of drafting an eight-pointed LeMoyne star in EQ’s EasyDraw. 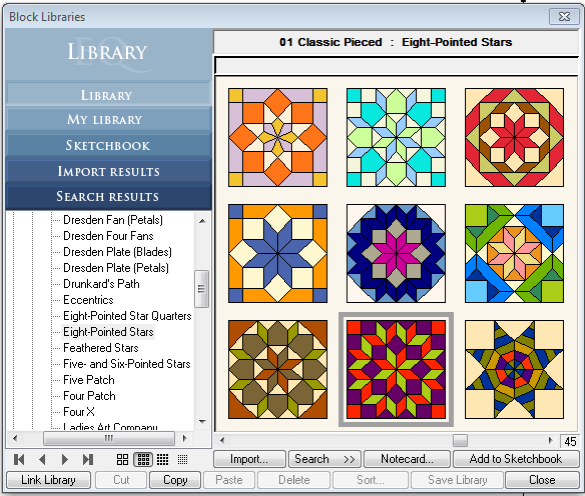 (You can also draw eight-pointed stars in Pieced PatchDraw in EQ). 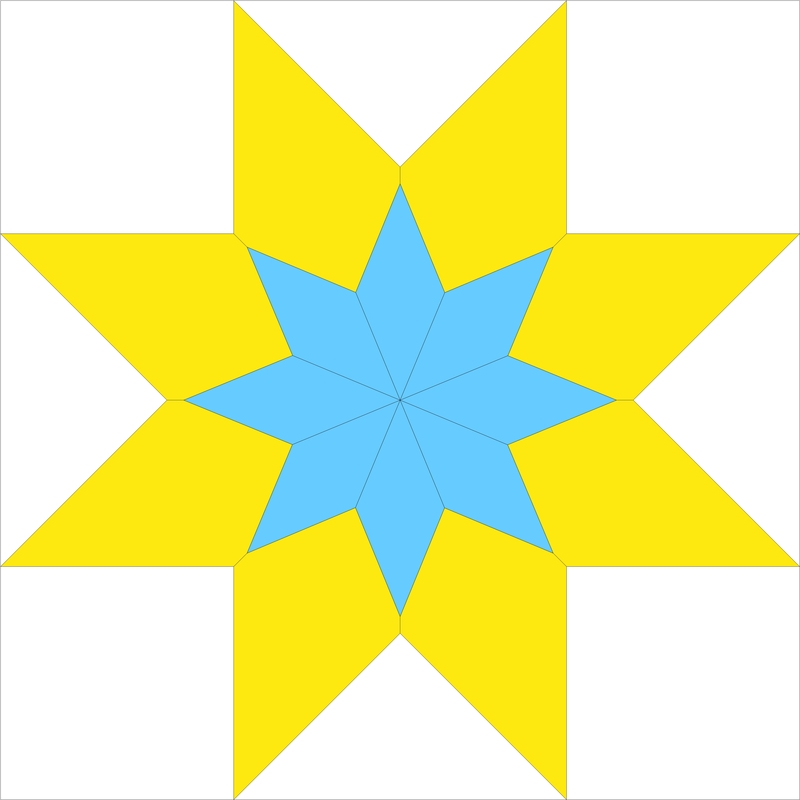 For beginners, an eight-pointed star is a bit tricky to draft on a square grid, since it is actually based on a circle. You can draw it on a regular square grid, if you know what particular grid to use, which is 24 x 24. Tip! 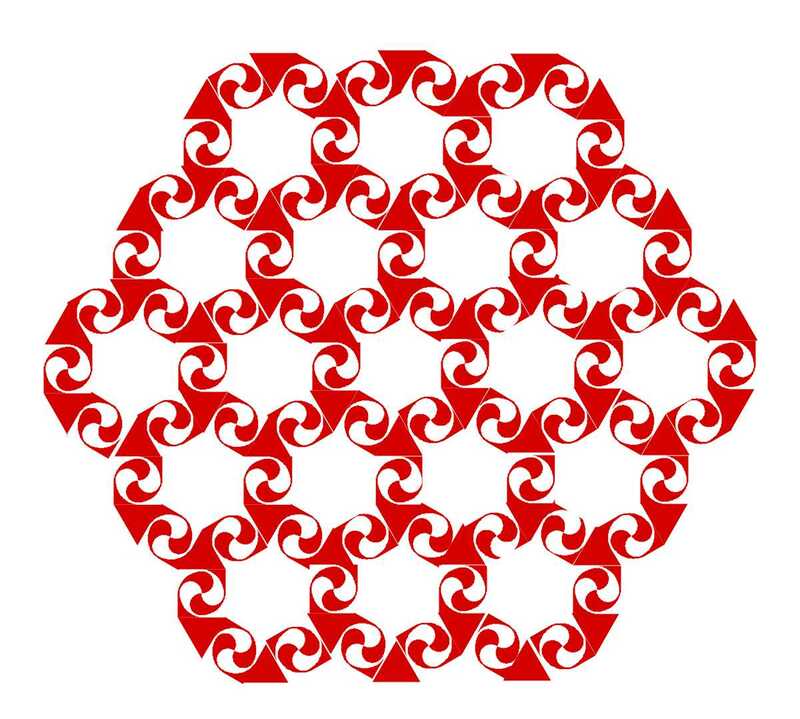 Remember the ratio between the squares and the triangles, so you can always draft an eight pointed star. 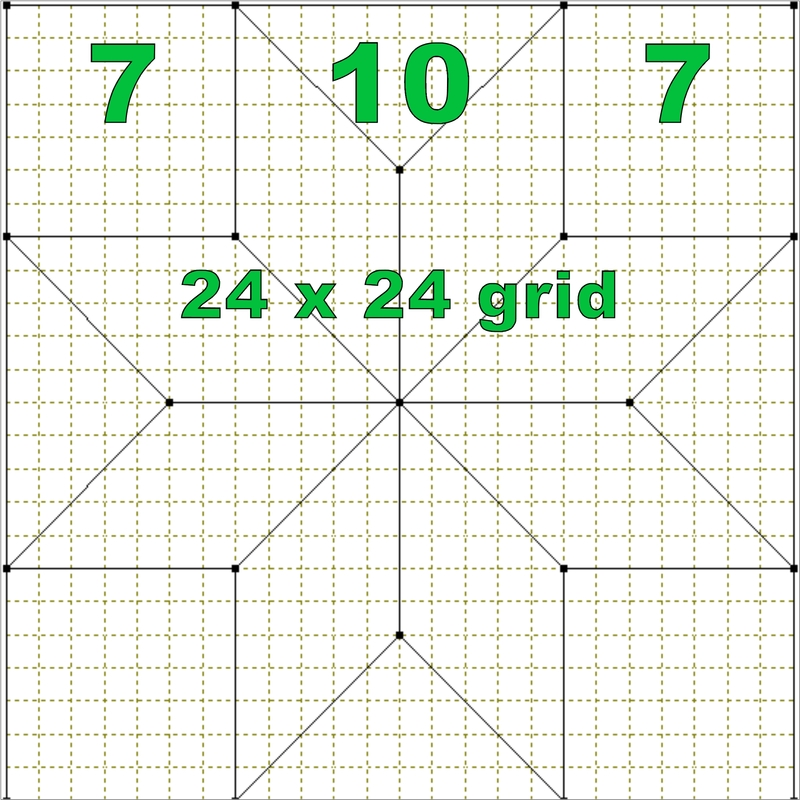 Now, it does not matter what size you want your final block to be, you start with a 24 by 24 grid. To make that easier, we start with a 12 inch block on the drawing board, instead of a 9 inch block, which is the actual size of Linda’s Inklingo Star. Remember, once you have drawn a block in EQ, you can resize it to any size you want. In the video below, I will start by showing you the drawing of a grid based LeMoyne Star in EQ. Next, I will show you the second way, and draft an additional eight-pointed star, based on a circle. I hope the video shows you clearly why I did that. 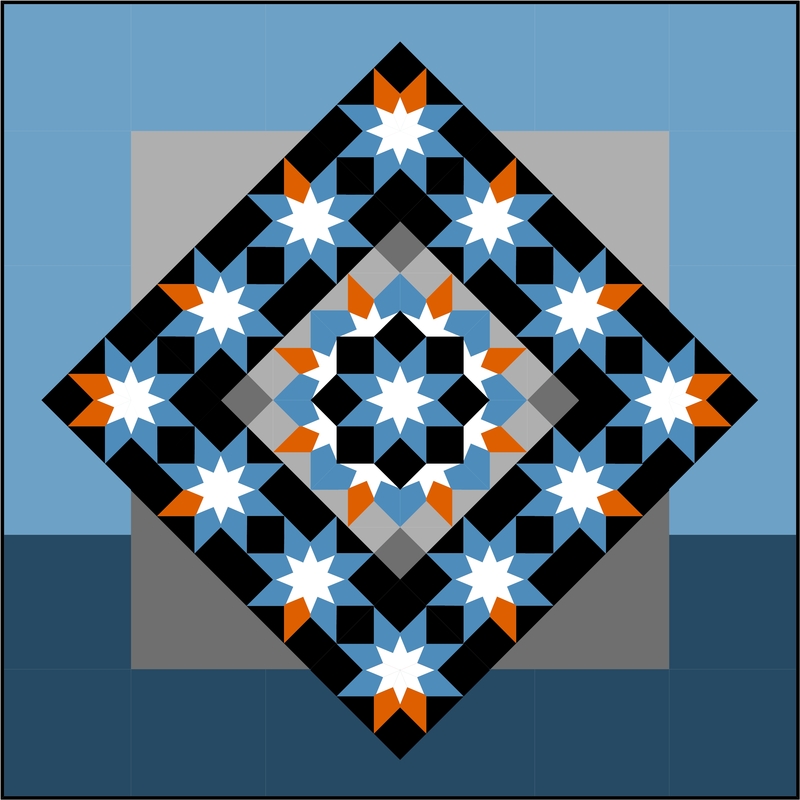 The easy thing to do would be to copy the first star, resize it to 50% (because I know the inner star is 4.5 inches in a 9 inch block), rotate it 27.5 degrees, and set it in the center of the first star. Unfortunately, you can only rotate blocks in EQ by whole degrees. I do that in the video, and it clearly shows that a 27 (or 28) degree rotation just does not do the trick! So, I am drawing the inner 4.5 inch star, starting with two circles, which I use as my guide for drawing the star points. This way, I can easily put the outside points of the star at any orientation in the block. I eyeball the placement of the circles, and after drawing them I check the placement by using the guidelines of the star that have the wrong orientation, because I know the size is correct. If I placed my circles correctly, the tips of the star points should touch my outer circle, and the lowest points of the ‘V’s between star points should touch the inner circle. If I just started by drawing a 4.5 inch diameter circle in the center of the block, my star would be too small! Once that inner star is drawn correctly, the circle lines are deleted. In the video, you can see me change snap settings half way. I increase them to 48, because I need additional snaps for correct placement of my circles. You can always change snap settings half way during drawing. But, remember, too many snap points increase your chances of your lines not connecting correctly. You see that happen in the video. That is why I decrease the number of snaps back to 24, after I have drawn the circles for which I needed 4 snaps to each inch. I hope this is enough explanation with what’s happening in the video. The video is 6.5 minutes, and has no sound. I recommend you watch it full screen, so you can read my settings etc. If you have questions, let me know, and I will answer them! Now that our Inklingo Star is drafted and saved in EQ, we use it as a basis to draw the more complicated Morse Star in EQ. I will show you that in a follow up post! 9 inch [22.9 cm.] blocks: Clamshell four patch with half Clamshells from the Clamshell Edges 4 inch Inklingo Shape collection, combined with the bonus shape from the Clamshell Rose Inklingo shape collection – 9 inch / 22,9 cm. Clamshell four patch met halve clamshells (uit de Clamshell Edges 4 inch Inklingo collectie patroondelen) en de bonus shape uit de Clamshell Rose Inklingo collectie patroondelen. Original design by Annika Kornelis. Bovenstaande quilt met 9 inch [22,9 cm.] blokken had ik al in EQ7 ontworpen, toen ik besloot dat ik jullie ook met een video wilde laten zien hoe je dit blok in EQ kunt tekenen. Maar ik kon me toch niet meer herinneren hoe ik het had gedaan! Dat was dus even weer uitzoeken :-). Maar het is gelukt, zoals de video hieronder laat zien. Deze video is beter dan de video’s in mijn vorige post. Ik heb het tekenen eerst een paar keer geoefend, en ik gebruik hulplijnen die het voor jullie gemakkelijk maken om dit na te tekenen. Er is geen geluid bij. Aan het begin van de video loop ik met de cursor even langs de gebruikte instellingen. Als ik de Snap Settings wijzig, geef ik dat ook even aan. Nog een tip voor het werken met de Curve Tool: Als je gebogen tekenlijn de verkeerde kant op loopt, druk je even op de spatiebalk op je toetsenbord, terwijl je je cursor vasthoudt. Dan buigt je lijn de andere kant op. Als je deze quilt of het blok wilt naaien, heb je de Inklingo Clamshell Rose collectie nodig, en de Inklingo Clamshell Edges 4 inch collectie. Alle Clamshell collecties vind je hier op inklingo.com. I had already designed the quilt at the top of this post in EQ7, when I decided I wanted to show you in a video how to draft the block in EQ. But I could not remember how I did it! So it took me quite a while to refigure this out :-). But, I managed, as the video below shows. This video is better than the videos in my previous post. First, I practiced drafting a couple of times, and I am using guide lines that make it easier for you to draft this after the example in the video. There is no audio. At the beginning of the video, I am pointing the cursor at the settings I used. I also indicate clearly where I change my snap settings. And a tip for working with the Curve Tool: If your line curves in the wrong direction, just press the space bar on your keyboard while holding the cursor. It makes your line curve the other way around. If you want to piece this quilt or the block, you will need the Inklingo Clamshell Rose shape collection, and the Inklingo Clamshell Edges 4 inch shape collection. You will find all Clamshell shape collections here on inklingo.com. Enjoy! Marianne vroeg mij om te laten zien hoe ik Inklingo Clamshell en Clamshell Rose blokken had getekend in EQ7, want zij wil er ook mee spelen! En ik kan me goed voorstellen dat meer van jullie dat willen, want deze collecties zijn zo inspirerend! En Linda laat op haar blog geweldig zien hoe veelzijdig deze nieuwe patroondelen zijn! Het tekenen is eigenlijk heel eenvoudig. Ik heb weinig tijd, dus vandaar geen stap-voor-stap tutorial, maar alleen twee screen recordings van het tekenen van een blok. Ik had maar tijd voor 1 opname per blok, dus er zitten nog wat foutjes in (op verkeerde knopjes gedrukt enzo). En dat het tekenen niet vlot doorloopt heeft ermee te maken dat ik steeds even naar een plaatje op mijn telefoon moest kijken, om te checken hoe ik verder moest. Als je zelf gaat tekenen is het gemakkelijker om een foto van het blok te importeren en op je werkblad te zetten om over te trekken. Let in de video’s (zonder geluid) even op de settings bovenaan in beeld. Linda geeft op haar site telkens precies aan hoe groot het blok is, dat voer je in als blokmaat.De clamshells zijn 4 inch, dus met een raster gebaseerd op blokjes van 2×2 zit je altijd goed. Verder is het tekenen heel eenvoudig. Het enige waar je rekening mee moet houden is dat je in EQ, vanwege de vierkante blokken ‘naden’ krijgt die je in het echt niet zou naaien, omdat je doorlopende hele clamshells gebruikt. Die extra ‘naden’ moet je dus negeren. De eerste video, helemaal bovenaan, laat een blok zien dat Linda hier toont. Het is asymmetrisch, dus dat moet je in zijn geheel tekenen. Van symmetrische blokken kun je een kwart tekenen, en ze dan in een quilt aan elkaar zetten. Dat laat ik in de tweede video zien. Voorbeelden van quilts met dit blok toont Linda hier op haar blog. Ik hoop dat dit duidelijk is voor jullie! Als er nog vragen zijn hoor ik het graag. Marianne asked me to show how I drafted the Inklingo Clamshell (Rose) blocks in EQ7, because she wants to play, too! I fully understand, these new collections are so great! And Linda is doing a great job showing off the versatility of these blocks on her All About Inklingo blog. So I am guessing many more of you would like to see how to draft these blocks in EQ7. It is really easy. Because I have little time, no step by step tutorial here, but just two screen recordings of me drafting blocks in EQ7. Some mistakes are included, because I only had time for one recording per block. The drafting looking a bit slow and uncertain has to do with the fact that I had to keep checking the picture of the example block on my phone! If you start to draft Linda’s blocks, it is easier to import a picture on your drawing table and trace that. In the videos, watch for the settings at the top of the EQ7 window. Linda tells us exactly what size each block is, use that as block size. The clamshells are four inches, so a grid based on 2 x 2 inch squares works fine. Next, drafting is simple. The only thing you need to keep in mind is that, because of the square blocks, EQ7 may give you seam lines which you would not actually sew, because you will use continuous, whole clamshells. So ignore those extra ‘seam lines’. The first video, top of this post, shows a block that Linda shows here on her blog. It is asymmetrical, so you have to draft it as a whole block. 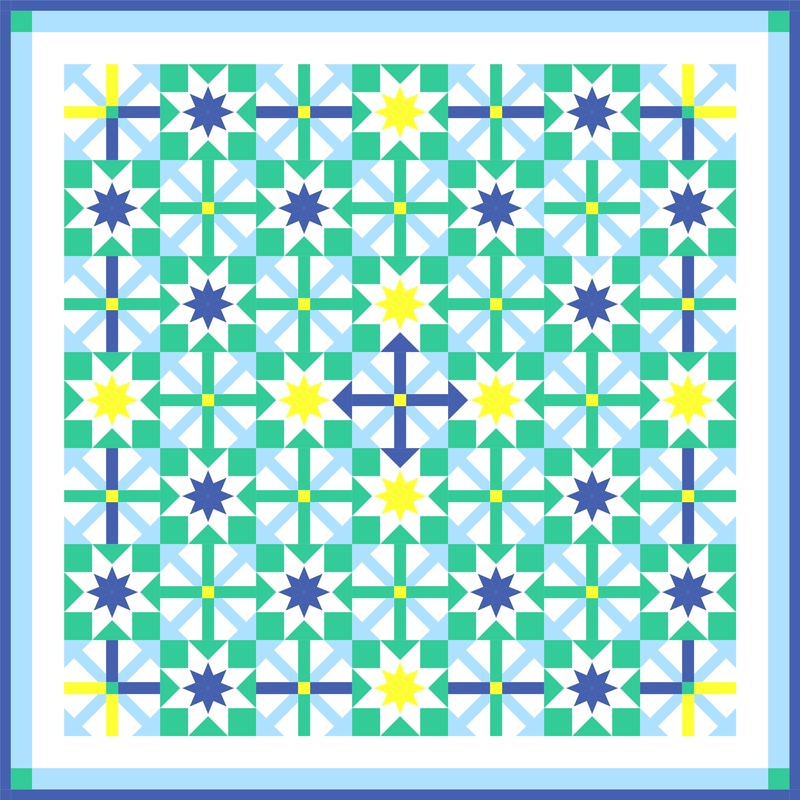 For symmetrical blocks, you can draft only a quarter, and then put them side by side in a quilt. I am showing that in the second video. 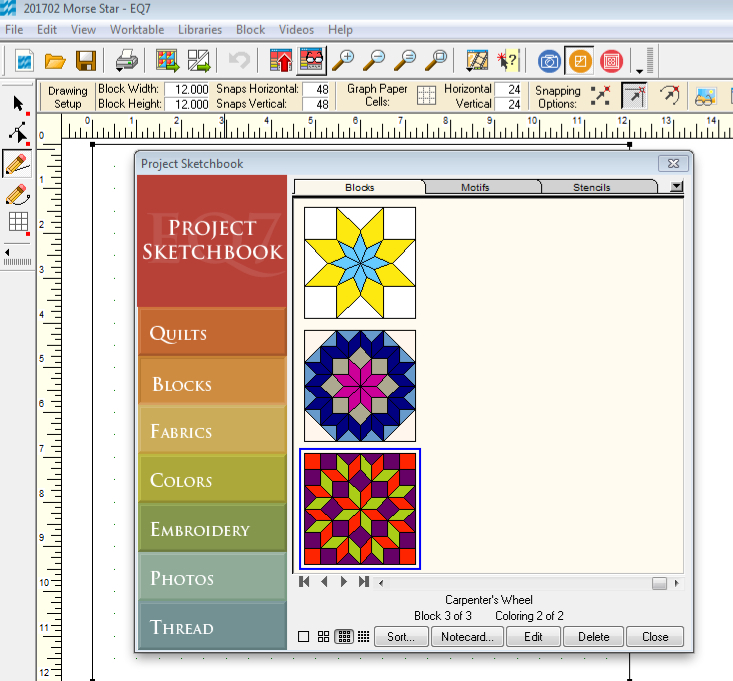 Linda shows examples of quilt designs with this block, here on her blog. I hope this is clear for you. Good luck! A Song For Inklingo’s 10th Anniversary! Hoera! Inklingo bestaat deze maand tien jaar. Gefeliciteerd, Linda & Monkey! Ik was al zo’n beetje vanaf het begin een fan, dus ik wilde dit zeker vieren. Ik heb een speciaal Inklingo-lied geschreven op een superaanstekelijke melodie. ABC van Jackson 5. Ik hoop hiermee nog wat meer mensen aan te steken met het Inklingo-virus :-). Helaas kan ik zelf voor geen meter zingen. Dus, lees de tekst hieronder (in de Engelse post), en blèr lekker zelf mee met de muziek van de video hierboven. Maar, als JIJ een video wilt maken waarin je dit lied zingt, dan wil ik die dolgraag zien! Pom, pom, pom…Print, Cut, Sew…! This month, Inklingo is around for ten years already! Hurray! Congratulations, Linda & Monkey! Unfortunately, I can’t keep a tune at all, or else I would have posted a video with me singing along. But I think everyone will be much happier if you yourselves just scream along with the ABC music, reading the lyrics below. Of course, if YOU want to post a video performing this song, I would love to see it! Na, na, na.., Print, Cut, Sew…! And to many, many years to come! You haven’t even tried it once? Makes the greatest quilts girl! And your education is complete! See how perfect it comes out! And you thought it would be tough! Now you can Inklingo, too! Vandaag zijn we verdrietig in huize Stof Genoeg. Gisteravond laat hoorden we dat Maarten van Roozendaal, een van onze favoriete zangers/liedschrijvers, is overleden op 51-jarige leeftijd. De wekkertjes waren al gezet, dus het was te laat om het nog op een zuipen te zetten en zijn muziek keihard te draaien. Daarom doen we dat nu maar. Ik tik met een geopende fles ‘Prozacco’ naast me, en we zingen mee met zijn mooie liedjes, vooral die over de dood (bijv. ‘Sterfbed’, een gedicht van Jean Pierre Rawie op muziek gezet door Maarten van Roozendaal). Twee jaar geleden heb ik ook al eens over hem geschreven, in deze post. Maarten van Roozendaal had een vrij klein publiek, o.a. omdat hij geen moeite deed om in de smaak te vallen bij een groot publiek, door bijv. aan tv-programma’s mee te doen. Maar zijn liederen en zijn vertolkingen waren geweldig. Dat vind ik niet alleen, dat vinden ook de jury’s van de diverse theater- en liedprijzen die hij heeft gewonnen. Zijn teksten zijn altijd poetisch, maar heel toegankelijk. Zijn liedjes zijn vaak grappig, maar wel scherp en soms op een beetje een zwartgallige manier. Als je hem nog niet kent, doe mij en jezelf een plezier, en bekijk wat van de YouTube videos via deze link: http://www.vetcabaret.com/Maarten+van+Roozendaal.html Mijn favorieten zijn: ‘Jij blijft bij mij’ (over een overleden vriendje, vanuit het perspectief van een kind) ‘Mooi’, ‘Red mij niet’ en ‘Goon’, met het New Cool Collective. Complete voorstellingen kun je bekijken via On-Stage.tv (pay per view). Korte impressies van zijn programma’s zijn ook te bekijken zonder een registratie. Today we are very sad in House Stof Genoeg. Yesterday night, we heard that Dutchman Maarten van Roozendaal, one of our favorite singer/songwriters passed away at age 51. We already set our alarm clocks, so it was too late to start boozing and play his music out loud. Therefore, we are doing that now. I have an open bottle of ‘Prozacco’ next to me as I write this, and we are singing along with his beautiful songs, especially those on death. (For example ‘Death bed’, a poem by Dutch poet Jean Pierre Rawie, put to music by Maarten van Roozendaal). I have written about him before, in this post from two years ago. Maarten van Roozendaal had only a small audience, among others because he made no effort to gain popularity with a larger audience, like appearing in tv-shows. But his songs and performances were magnificent. It is not just me that thinks so, but also the juries of the several theatre and song awards he won. He sang in Dutch only, but in his younger years he was often compared to Tom Waits and Jacques Brel. Later, it was acknowledged that he was very much his own man, with his own specific genre of songs. It was always poetic, but very accessible. His lyrics are often comical, but in a sharp and a bit dark manner. If you are interested, there are several videos of him via this link http://www.vetcabaret.com/Maarten+van+Roozendaal.html. But note that he only sang in Dutch. Als je de reizende tentoonstelling met het werk van de Franse modeontwerper Jean Paul Gaultier nog niet hebt bezocht, is komende week je laatste kans. De Kunsthal heeft wegens de overweldigende bezoekersaantallen de openingstijden verruimd, en is nu o.a. ook op maandag open. Wij hebben vandaag deze prachtige Bevrijdingsdag gevierd door ons onder te dompelen in Gaultier’s bevrijdende couture. Daaruit blijkt zijn onconventionele blik op mannen en vrouwen, seksualiteit, zijn creativiteit, humor en technische vakmanschap. Ik heb wat filmpjes gemaakt, maar de camera van mijn iPod is niet geweldig. Dus hier ook een YouTube filmpje van de tentoonstelling op een andere locatie. Vrijwel alle getoonde creaties tonen niet alleen een concept of visie, maar zijn ook ‘gewoon’ prachtig en elegant. Niet alleen de sprookjesachtige zeemeerminnenjurken, maar ook de sm-achtige outfit of de jurk van een vuilniszak. Heel bijzonder! En niet alleen het tentoongestelde is zeer de moeite waard, ook de tentoonstelling zelf. De opstelling en aankleding is opwindend en verrassend. De haute couture die ik tot nu toe gezien heb stond altijd achter glas. Gecombineerd met de noodzakelijke spaarzame verlichting (textiel is erg kwetsbaar voor o.a. UV-straling) geeft dat een tombe-achtige sfeer waarin je automatisch gaat fluisteren. Maar hier zijn verschillende middelen ingezet om dat allemaal te vermijden. Sfeervol geluid (nooit te hard, erg prettig! ), paspoppen met bewegende gezichten, die spreken of zingen. Een draaiende carrousel met paspoppen. En overal kun je met je neus bovenop staan! Het was druk, maar alles was perfect te zien. Geen koorden om achter te blijven staan, je kon het vakmanschap closeup bewonderen. En wat me erg opviel, niemand raakte het kwetsbare textiel aan. Dat had makkelijk gekund, en op quilttentoonstellingen zie ik het tot mijn ergernis ook vaak gebeuren. Maar hier dwongen de creaties kennelijk genoeg respect af. (Een video van de outfit van Dana International, de Israëlische Songfestivalwinnaar. Helaas zijn kapsel en bewegend gezicht niet goed te zien). Als je nog gaat, let dan ook op de kralen, het borduurwerk, het haakwerk, het breiwerk, het kant, het appliqué, de schoenen en de kapsels. (O, die kapsels!). Deze tentoonstelling is al in diverse landen geweest, en gaat deze zomer naar Zweden, en daarna naar New York, en in 2014 naar Londen. Meer informatie hier. If you had have not yet visited the traveling exhibit with the work of the French fashion designer Jean Paul Gaultier, next week is the last chance to do so in Rotterdam. The Kunsthal has extended its visiting hours, and is also open on Mondays now. Today is Liberation Day in The Netherlands, and we have celebrated it by immersing ourselves in Gaultier’s liberating couture. It shows his unconventional outlook on women and men, sexuality, his creativity, sense of humour and technical craftmanship. I have made some videos but the camera on my iPod is not great. So I have also included a YouTube video from this exhibit at another venue. Most of the creations on show do not just portray a concept of vision, but are also ‘just’ stunning and elegant. Not just the fairytale mermaid dresses, but also the sm-like outfits or the dress made of a garbage bag. Very special! And not just the dresses and suits on display are worth viewing, also the exhibit itself. The mounting and furnishing is exciting and surprising. The haute couture I have seen so far was always behind glass. Combined with the required sparse lighting (fibre is very vulnerable to UV-radiation etc. ), it makes for a tomb-like ambiance, which automatically makes you whisper. In this exhibit they used several ways to prevent all of that. Atmospheric sound (never too loud, very nice! ), mannequins with moving faces, speaking or singing. A revolving carrousel with mannequins. And everywhere you could get up close to the couture! It was crowded, but everything was still perfectly accessible. No ropes to keep you behind, we could admire the craftmanship in close view. And what struck me, nobody touched the fragile textiles. It could easily have happened, and I often see it in quilt shows, much to my annoyance. But in this exhibit, the creations apparently won enough respect. If you are going to see this show, do pay attention to the beads, the embroidery, the knitting, the crocheting, the lacework, the appliqué, the shoes and the hairdo’s. (Oh, those hairdo’s!). This exhibit has travelled in several countries already, and continues to Sweden, New York, and London in 2014. More information here. Go and see it if you have the chance! Vandaag heeft Linda op haar All About Inklingo blog een video gepost met (minstens) 50 verschillende Double Wedding Ring quiltontwerpen! Het deed mij denken aan vijftig jaar huwelijk, voor elk jaar een andere quilt. Wat prachtig symbolisch om op elke trouwdag een nieuwe quilt op je huwelijksbed leggen in hetzelfde patroon! Elk jaar hetzelfde, en toch weer helemaal nieuw. Linda’s video vind je hieronder. Luister vooral ook naar de passende muziek! Ter gelegenheid van deze video heb ik het versje vandaag ook vertaald in het Engels, dus als je het leuk vindt, kun je die versie hieronder ook lezen. Today, Linda posted a video on her All About Inklingo Blog, with (at least) 50 different Double Wedding Ring quilt designs! It made me think of fifty years of marriage, with a different quilt for every year. How beautifully symbolic to put a new quilt on your bed in the same pattern for each anniversary! Each year it’s the same, yet different, and new all over. Don’t worry, I did not recite it at the party. Ik heb vanavond voor het eerst van mijn leven een 3D film gezien, Hugo van Martin Scorsese. Prachtig!! Ik had niet gedacht dat ik de 3D-beleving zo magisch zou vinden, en ik weet zeker dat dat te maken heeft met de manier waarop 3D een extra laag toevoegt aan het verhaal, het is hier meer dan gewoon een special effect. Ik zou zeggen dat 3D een dimensie aan deze film toevoegt, zoals quilten een patchwork top tot leven brengt. Na afloop van de film vroeg ik me direct af wanneer ik mijn quilts in 3D zou kunnen ontwerpen… Het moet technisch al mogelijk zijn, maar wanneer kan ik thuis, op mijn eigen computertje, bovenstaande quilt weergeven in levensechte stoffen? Wanneer kan ik verschillende quiltmotieven in 3D bekijken in de grote zeshoeken, en de effecten van verschillende soorten vulling bekijken op het scherm? Neem ik katoenen stof, of toch maar zijden satijn? Een laag wollen vulling, of toch twee lagen katoen? En als ik de quiltsteken iets groter maak, wat is dan het verschil in textuur…? O, ik kan niet wachten tot het zover is! En stel je voor hoe educatief het zou zijn om al die instructie video’s voor quilten en naaien in 3D te kunnen zien! We gaan het vast nog meemaken, maar tot die tijd zijn hieronder twee filmpjes van Linda Franz in ‘gewoon’ HD video. Ze laat heel duidelijk zien hoe je een zespuntige ster kunt naaien met de hand, en Inklingo’s lijntjes en markeringen. Tonight, for the first time in my life, I saw a 3D movie. Hugo, by Martin Scorsese. Wonderful!! I did not think I would find the 3D experience so magical, and I am sure the fact that I did, has to do with the way 3D adds an extra layer to the story, it is more than just a special effect. I would say 3D brings dimension to this film, like quilting brings a patchwork top to life. 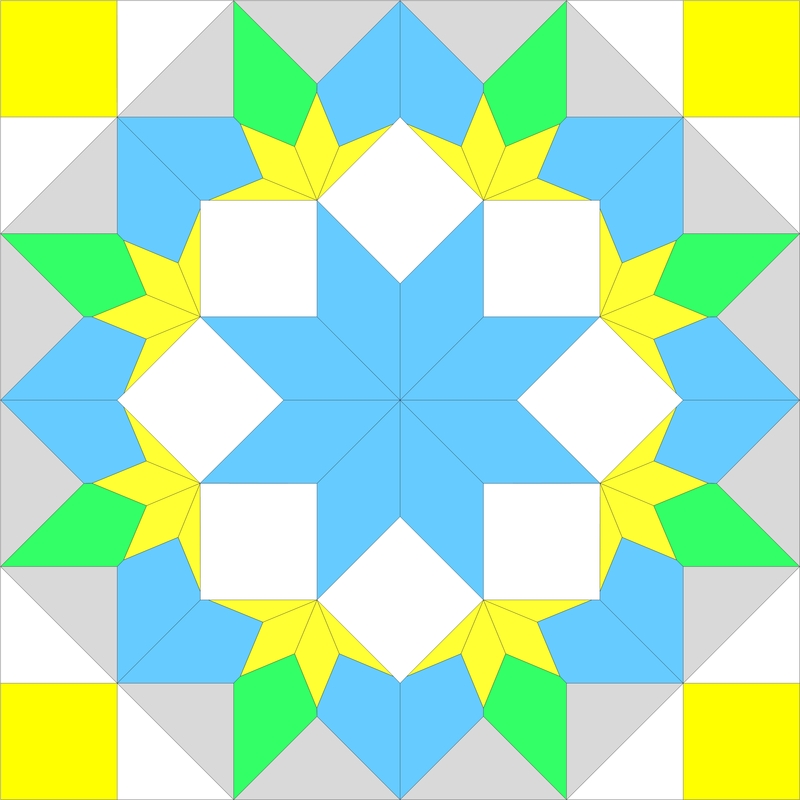 Immediately after leaving the cinema, I was wondering when I would be able to design my quilts in 3D… I am sure this is technically feasible already, but when will I be able to see the quilt above, designing at home, with my own little computer, in lifelike fabrics? 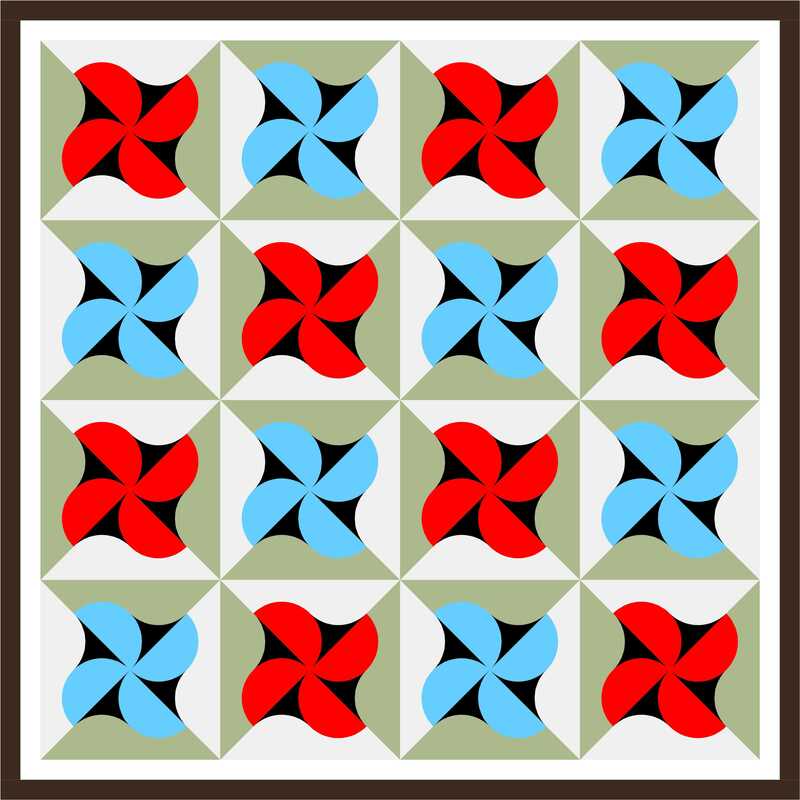 When will I be able to audition several quilting motifs in 3D, and audition the effects of different battings on screen? Will I use cotton fabric, or silk satin? One layer of wool batting, or two layers of cotton? And if I make the quilting stitches larger, what will be the difference in texture…? O, I can’t wait for this to happen! And, imagine how educational it would be to be able to see all these instruction videos for quilting and sewing in 3D! I am sure we will live to see it, but until that day, here are two videos by Linda Franz in ‘ordinary’ HD video. She shows very clearly how to hand piece a six pointed star, with Inklingo’s lines and crosshairs.